PetStoreMarketer.com is powered by Insight Out of Chaos (IOOC), a privately held marketing company based in New York City. A pioneer in the data-driven marketing field, IOOC specializes in customer loyalty and frequent-buyer programs. Since 1995, IOOC has helped billion-dollar corporations and more than 1,000 independent pet stores, hardware stores, and other retailers market to their customers through email, direct mail, and other media. 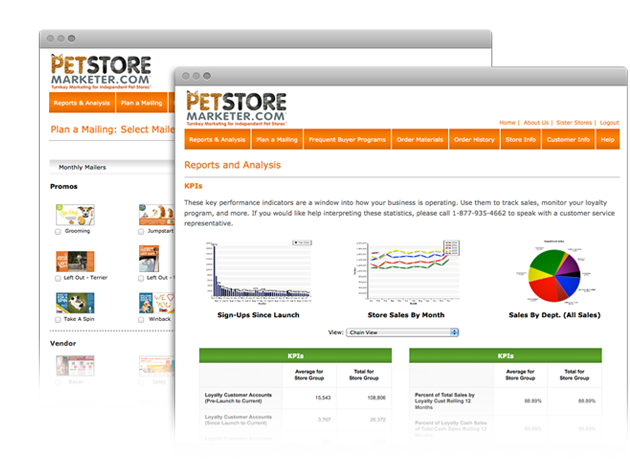 At PetStoreMarketer.com, we believe that every business, no matter its size, should have access to the sophisticated marketing tools that the big chains use. Our goal is to make targeted marketing programs simple and affordable — empowering small businesses to get the maximum return on each marketing dollar they spend. But enough about us. Let's talk about growing your business. Get the insight you need to make customers happy and grow sales. As an independent pet store owner, you now have access to the tools the largest chains use to direct their marketing dollars where they work hardest. With our team of loyalty marketing experts at your side, you'll be amazed at how easy and effective developing a sophisticated marketing strategy can be. For the first time, you can enjoy the clout and low costs that the corporate chains have to leverage targeted marketing, driving incremental sales and profits. The buying power of our growing group of independent pet member stores allows us to keep costs low.